The Rev. 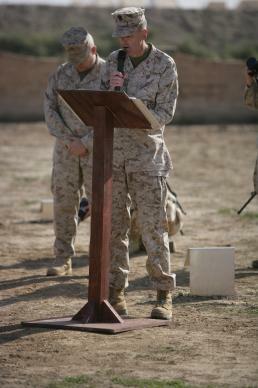 Richard Pusateri, former senior supervisory chaplain for the U.S. Marine Corps preaching to troops in Habbaniyah Al-Anbar Province, Iraq. Congregations that want to do more than pray for veterans on Veterans Day might consider providing copies of a historic book of devotions to military troops and veterans in Veterans Affairs hospitals. The Strength for Service Corporation, a nondenominational organization created by the United Methodist Commission on United Methodist Men, sends free copies of “Strength for Service to God and Country” to chaplains who distribute the books to men and women on active duty and patients in VA hospitals. Those chaplains said the devotionals have an impressive reach and a powerful spiritual effect on those who receive the pocket-size book. The Rev. Richard Pusateri served as senior supervisory chaplain for 150 Marine Corps chaplains, many in southwest Asia from 2005 to 2009. 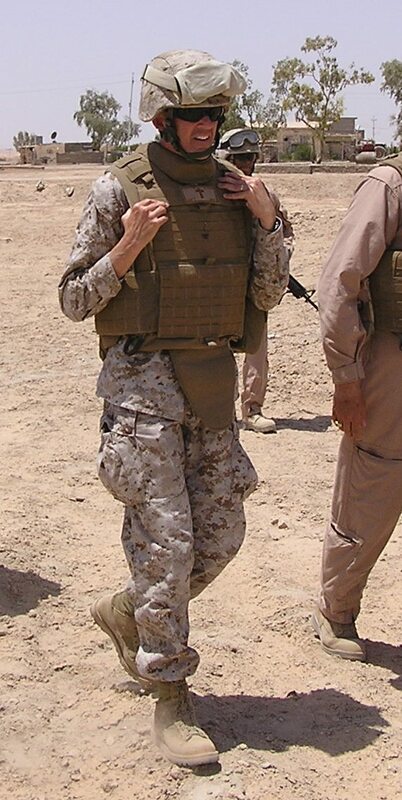 “While I spent most of the time in Iraq, I also served in the Horn of Africa, Kuwait, Bahrain, Qatar, Afghanistan, Jordan and Egypt,” said Pusateri, now executive for itineration and missionary support for the United Methodist Board of Global Ministries in New York. “Throughout my tour of duty, I was continually impressed to see the reach of ‘Strength for Service to God and Country’ in the combat theater. The Rev. Richard Pusateri, former senior supervisory chaplain for the U.S. Marine Corps, visited bases in Iraq, the Horn of Africa, Kuwait, Bahrain, Qatar, Afghanistan, Jordan and Egypt, where he was impressed by the reach of “Strength for Service” in combat theaters. Pusateri is shown in this file photo in Kabani Village in Al Anbar Province, Iraq. UMNS photo courtesy of UM Men. “I found copies of the devotional book while waiting for helicopters and convoys in tents and small huts,” added the 30-year Navy veteran. “I also saw the historic books in tiny chow halls, rec rooms, medical-aid stations and on the tables in company command posts.” Pusateri was a Navy chaplain assigned to the Marines. Steve Sexton, a chaplain at the VA Medical Center in San Diego, said he routinely gives books to WW II, Vietnam and Persian Gulf veterans receiving end-of-life care in the palliative care unit. “I had the privilege of seeing several veterans experience significant spiritual healing at this crucial time in their lives, and the Lord has used this devotional in a special way,” said Sexton. Sgt. Mark Wright, chaplain assistant at the Warrior Transition Battalion in Fort Benning, Georgia, agreed. “The soldiers here are all wounded and always have a need for a daily word to pick them up. I thank you for the ministry that you do through this,” Wright said. Maj. Rick Cantrell, chaplain of the U.S. Military Academy at West Point, said he gives copies as graduation gifts.“They highly value such a historic and yet spiritual document. Please share with the caring members of The United Methodist Church that these devotionals are placed in the hands of the future leaders of the United States Army and thank them for their contributions,” Cantrell said. U.S. Navy Chaplain David Glassmire said Marines in Iraq sometimes provided copies of “Strength for Service to God and Country” to their Iraqi counterparts. “Through a simple, faith-based devotional, people came to share from their hearts about what faith in God meant for them,” said the chaplain. In 1942, the Methodist Publishing House wanted to do something for people who had volunteered for combat across the Pacific and Atlantic oceans. After considering several options, the publishing agency decided to ask 365 leaders from nearly every Christian denomination to write one-page devotions with a Scripture reference, a prayer and a meditation. The result was “Strength for Service to God and Country,” carried by a million combatants during World War II and the Korean conflict. The book went out of print in 1953. In 1998, a Roman Catholic Boy Scout thumbed through a tattered copy of the book of daily devotions sitting on the bedside table of his grandfather. With financial support from others, the Strength for Service team continues to send books to chaplains who distribute them. One way to support veterans as well as troops on active duty on Veterans Day is to register your church’s credit card with Home Depot. Three percent of the purchases at a local store will provide free copies of the books. Some churches purchase the book to give to church members, while others provide funds for chaplains to give the books to men and women under their care. For information about ways to give, visit the Strength for Service website or send email request to mstow@gcumm.org. Evan Hunsberger, who was looking for an Eagle Scout project, asked his World War II veteran grandfather if it would be possible to reprint the book for bases near his southern California home. Evan received permission from the United Methodist Publishing House. Staff members of the successor agency of the Methodist Publishing House did not even know the book existed. Evan also sought assistance from the Commission on United Methodist Men, the agency responsible for Scouting ministry. That Nashville-based agency received support from the Pentagon and helped Evan add some 40 contemporary devotions to the historic volume. To everyone’s surprise, the modest effort to provide a few hundred books to California military bases resulted in publication of 500,000 copies for men and women serving in bases around the world. *Peck is a retired clergy member of New York Annual Conference with 50 years of experience with annual conference communications, the United Methodist Publishing House, United Methodist Communications and the General Commission on United Methodist Men.